The first drayage truck Toyota used to retrofit into a fuel-cell was a Kenworth T660. Toyota pimped the Kenworth Truck Company using two fuel-cell Mirai sedans to create the T660. A Drayage truck’s CO2 emissions are equal to 22 units of Passenger vehicle. 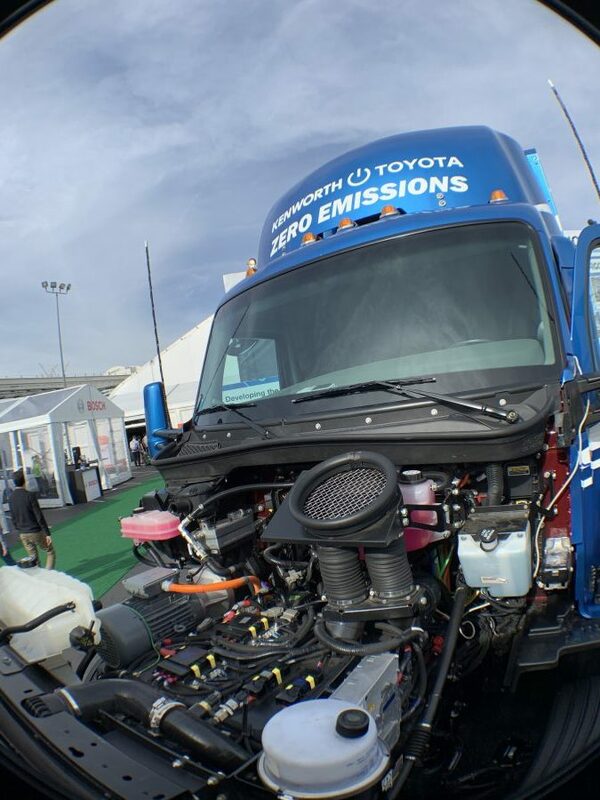 Chris Rovik, engineer and executive program manager of Toyota Motor North America’s advanced fuel cell development and Portal Project, says there are about 15,000 trucks at the Port of Los Angeles and Port of Long Beach in the Los Angeles Basin, in California. 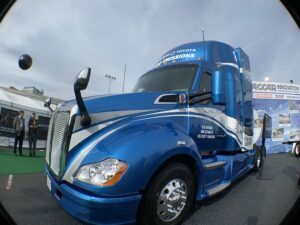 The project was a success and at the Consumer Electronics Show (CES) Bob Carter, Executive Vice President – Sales Toyota Motor North America, announced that Toyota was “collaborating with PACCAR, the parent company of Kenworth, to develop fully-capable, zero-emission electric Class 8 trucks powered by two Mirai fuel cell stacks. The original Portal proof-of-concept truck has logged nearly 10,000 miles hauling freight from the Port of Los Angeles and the Port of Long Beach to rail yards and warehouses across the L.A. Basin. Thanks to the support of the Port of Los Angeles and the California Air Resources Board, we’re putting ten new trucks on the road to haul even more goods across the Los Angeles area, all with zero emissions. This is not a science experiment – the goal is to make a difference in society – to improve air quality in and around the Port of Los Angeles. Imagine what we can do with the scalability of this project! It is an amazing truck, and I encourage all of you to see it for yourself in the PACCAR booth in the North Hall. In addition, we are pioneering research in artificial intelligence, advanced materials, human support devices, and physical rehabilitation to develop robots that can assist the elderly, physically disabled, and those with injuries. And we’re investing in the potential of connected networks that can bring together mobility services with the people who need them. 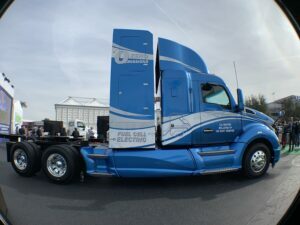 Chris Rovik, engineer and executive program manager of Toyota Motor North America’s advanced fuel cell development and Portal Project talks about the Kenworth T680 collaboration at the Consumer Electronics Show (CES).